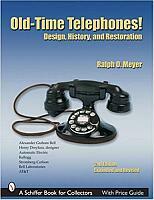 The 3rd edition of Ralph Meyer's popular book, Old-Time Telephones, first published in 1995, was recently published electronically by North Carolina State University. A long time "go-to" reference for collectors, for the first time, the 3rd edition is available only on-line in electronic form. It may be read on a computer or tablet, with the ability to zoom in on details of photos or diagrams. Portions may be printed as desired. It includes many updates, based on comments on the 2nd edition (see below) and on additional research done by the author while preparing other articles on telephone history. The text is searchable, so no index is needed. The book may be downloaded as a pdf file and copied, and redistributed in accordance with the terms of a Creative Commons license, described in a summary called a "deed," on the 5th page of the pdf. Ralph O. Meyer is a Phi Beta Kappa graduate of the University of Kentucky and earned a Ph.D. in physics from the University of North Carolina. He did experimental research at the University of Arizona and Argonne National Laboratory, and his main career was in technical work for the U.S. Nuclear Regulatory Commission. For more than 30 years, he studied and wrote about the history and development of the telephone. He writes a technical column for Singing Wires, the journal of Telephone Collectors International, and for the past few years he has been working with North Carolina State University on telephone-related design topics. 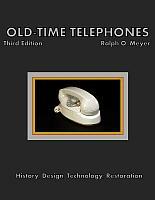 The 2nd edition of Old-Time Telephones, published in 2005, is the last printed edition, and is on many collectors' bookshelves. The 2nd edition served as the basis for Telephony 101, a series of on-line discussions held on the TCI Listserv beginning in November 2012. Files used in the discussions are archived in the TCI Library, and can be used today as the basis for self-paced study of Old-Time Telephones. The Telephony 101 archive also includes errata sheets for the 2nd edition in several formats, that may be used to update your book. A special version of the 3rd edition is available exclusively to TCI members, and may be downloaded only from the Members Area of the TCI site (login required). Several unique features help users familiar with the earlier editions quickly identify new material. Changes from the 2nd edition are highlighted in yellow. A Price Guide - not in the 3rd edition for the general public - is included. The special Collector's Draft does NOT include a license to copy or redistribute the file. Download the special Collector's Draft only for your own personal use. Do not share it. Each member should download his or her own copy from your Members Area in the above menu. If you wish to share copies, use the generally published version of the 3rd edition, which is freely available to everyone. The 2nd edition of Old-Time Telephones was used as the basis for a series of articles in Singing Wires, the monthly journal of TCI, starting in May 2016. In mid-2018, over 20 installments have been published in this ongoing series. Not a TCI Member yet? It's easy to join!